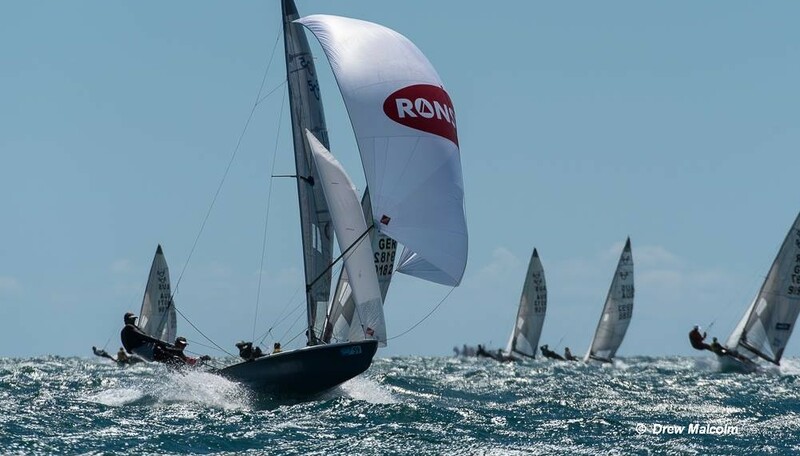 Mike Martin and Adam Lowry of the USA consolidated their lead with two more race wins on day 3 of the International 505 World Championship at Fremantle SC, Australia. With the discard now taken Martin and Lowry (1,1,2,1,1) have a 17 point lead ahead of Mike Holt and Carl Smit, with Howard Hamlin and Jeff Nelson in third place to make it an all USA podium. Australia’s Peter Nicholas and Luke Payne won the first race (R4) with Martin and Lowry in second and looking set to dominate the day. In third place were Britain’s Penny and Russ Clark with fourth going to Holt and Smit. Martin and Lowry moved up a place in the second race, winning ahead of Australia’s Peter Nicholas and Luke Payne, with third going to another Aussie pair, Malcolm Higgins and Nick Johnston. In fourth place were Holt and Smit with Hamlin and Nelson in fifth, and Julian Stueckl and Johannes Tellen of Germany sixth. In the final race of the day (R6) Martin and Lowry finished ahead of Britain’s Nathan Batchelor and Harry Briddon with Ian Pinnell and Reeve Dunn in third place. Hamlin and Nelson finished fourth and in fifth place were Parker Shinn and Eric Anderson of the USA. With the championship back on track Martin and Lowry are looking odds-on to take the title. There is a lay day Saturday, then two more days of racing to complete the championship.